Three Volumes for ONE Special Price! A Bundled Bargain at our Best Rate! Volume 2 of European Portuguese introduces hundreds of ALL NEW vocabulary words. Subjects focus on home, clothing, food, and other areas of daily life. Enhance your ability to converse with confidence when you listen to the native speaker and practice aloud in the privacy of your home or car. Refer to the included reference cards to check spelling and reading comprehension. 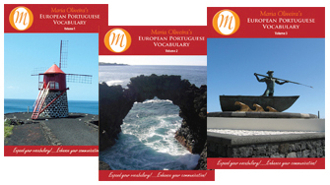 Volume 3 in the European Portuguese Vocabulary series contains 22 lessons of all new words for a variety of subjects. Learn the names of the areas of a home, from the bedroom to the kitchen, and the objects in them. Name the parts of the human body, and helpful health related nouns.Foods that make up a meal will increase your comfort level when dining at a home or in a restaurant.Learn the name of clothing items and footwear.Study about education, including items found in a classroom.